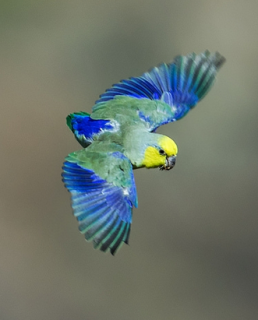 Parrotlets were kept in France as long ago as 1682. Male-bright yellow forehead, crown, cheeks and throat; occiput and nape purple/grey, extending in a stripe to eye; olive/grey mantle, upper back and lesser wing coverts to scapulars and inner secondary feathers; deep blue lower back, rump, upper tail coverts and underwing coverts; purple/blue secondary coverts; inner primary feathers suffused with blue at bases; green/yellow underparts. Bill horn in colour with grey at base of upper mandible. Eye brown. Female-as in male but lower back and rump paler blue in colour; primary and secondary coverts, secondary feathers and bases to primary feathers all green tinged with blue. As in adults but dull overall, less yellow on face. Grey absent on bill. Rare; unknown until 1979 or so. Walk-in enclosure, minimum length 2.1m (7 ft) or indoor aviary minimum length 1.8m (6 ft). Small seed mix: canary, millet and smaller amounts of oats, buckwheat and safflower; limited sunflower seed; spray millet; seeding grasses; green leaves such as: Swiss chard, lettuce, dandelion, chickweed, sowthistle; rearing food made with hard-cooked eggs, carrot and wholegrain bread all ground up; fruits such as: apple, pear, etc; complete kibble. Bathing using overhead misters or shallow water bowls, socialization; swings, ladders, perches, chew items (fir, pine, willow twigs, sterilized pine cones, vegetable tanned leather), foraging toys, puzzle toys. Trapping for the wild bird trade, where the mortality rate during capture is estimated at 40-100%. An emerging threat is the construction of four dams on the Rio Marañón. NW Peru; confined to upper Rio Marañón valley, from E La Libertad north to SE Cajamarca and S Amazonas. Found from 800-1000m (2624-3280 ft), rarely 2400m (7872 ft), in arid, lightly wooded habitats in the upper tropical and subtropical areas including scrub, riparian vegetation, open balsa woodland, cactus montane desert and open country with scattered vegetation. Food items include cactus and tree fruits, seeds and flowers; also grass and wheat seeds. Social birds; roosts communally. Up to 70 pairs in communal nesting area.